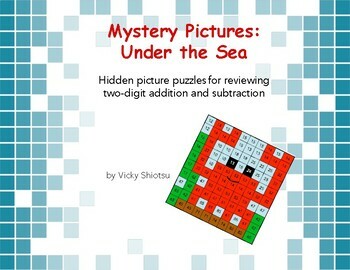 These mystery pictures provide a fun review of two-digit addition and subtraction. Leave them at a center for independent learning or assign them as homework. They're perfect for early finishers, too! 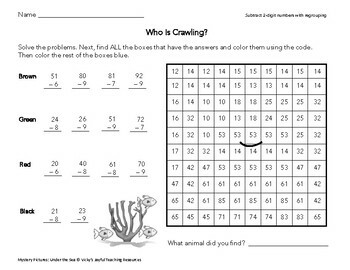 Problems with and without regrouping are included on separate worksheets. Choose the one that best fits the needs of your class. Or, if your students have varying skills or you're teaching a combo class, you can reproduce different worksheets for different students. Mystery Picture: Who Is Hiding? I hope you and your students have fun with these pictures. 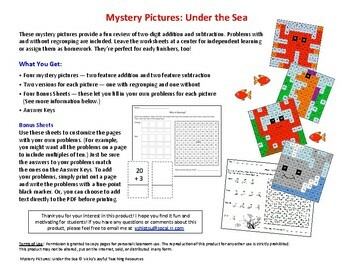 If you're interested in more mystery pictures, here are some Hundred Chart Mystery Pictures for you to check out. Hundred Chart Mystery Pictures: Who Lives Here? FREE! Hundred Chart Mystery Picture: Who Lives on a Farm? FREE! Hundred Chart Mystery Picture: Who Is on a Leaf?